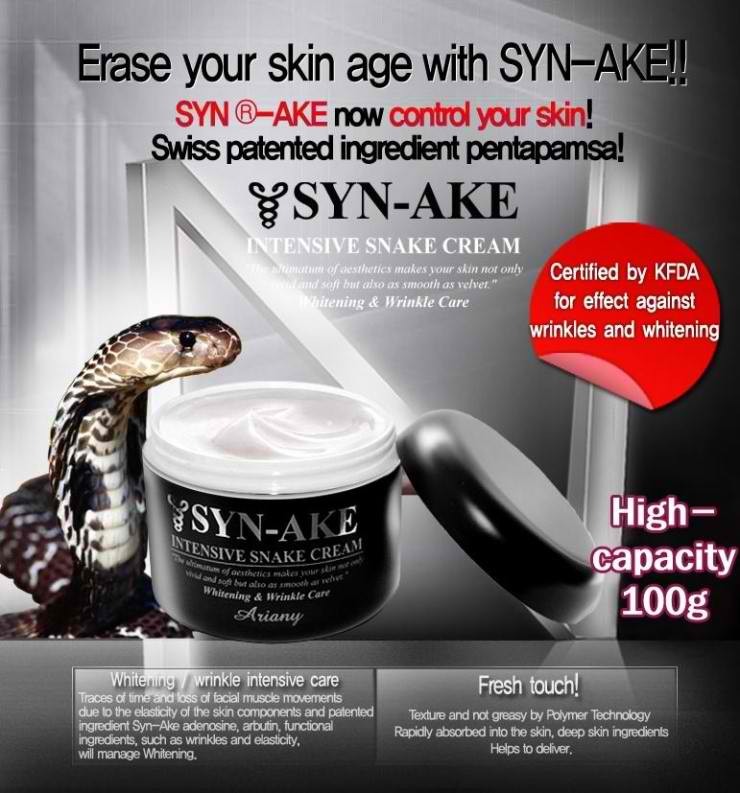 SYN-AKE Intensive Snake Cream (100g) is a KFDA approved anti-wrinkle, moisturizing and whitening cream that contains SYN-AKE. SYN_AKE is an active anti-wrinkle compound based on synthetic peptide ingredient that mimics the effect found in snake venom. SYN-AKE is scientifically and clinically proven to quickly reduce fine lines and wrinkle depth. This compound was well-recognized and was lauded by the Swiss Technology Awards. It was awarded with numerous European patents because it was proven to reduce wrinkles by up to 52% and to create a smoothing effect by up to 82% within the first few weeks of application. SYN-AKE Intensive Snake Cream helps smooth out fine lines and wrinkles while delivering intense moisture to the skin. It is also enhanced with whitening care for skin brightening effects. It has been dubbed as "BOTOX in a JAR" and has been used by many celebrities. It is suitable for all skin types.